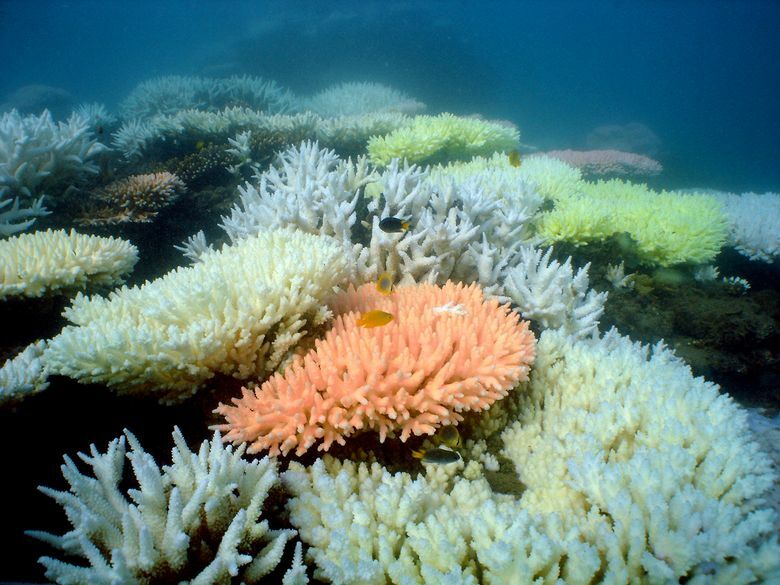 One cause of the loss of coral is coral bleaching. (Photo courtesy of Ray Berkelmans, Australian Institute of Marine Science). Soon, beachgoers won’t be able to buy certain top-selling sunscreens along parts of the Florida Keys. The Key West City Commission voted Tuesday night to ban sunscreens containing oxybenzone and octinoxate, two chemicals that have been shown to be damaging to coral reefs. Beginning in January 2021, Key West will ban such sunscreens from sale within city limits — taking a cue from Hawaii, which became the first state to pass a similar ban. “To me, this is a pretty black-and-white issue,” Key West Mayor Teri Johnston said ahead of the vote. Though sunscreen brands such as Banana Boat and Hawaiian Tropic sell some products without oxybenzone and octinoxate, there are still many containing those chemicals on drugstore shelves. For years, oxybenzone and octinoxate have been used to protect people’s skin from UV radiation, but some research has shown that skin care products containing these chemicals can wash away from the skin while swimming or bathing and seep into the water, causing damage to coral reefs. Johnston, the mayor, said that the Great Florida Reef, which is the largest reef in the continental U.S., is vital to the tourist town both environmentally and economically and that banning the sunscreens containing those toxins was simply “the right thing to do.” She said that leading up to the vote, documentation was presented on both sides of the debate, but it seemed to her that there were adequate nontoxic sunscreens that would both protect people’s skin, as well as marine life. In a 6-to-1 vote Tuesday night, the city commission banned the sale of sunscreens containing the chemicals. The mayor said she hopes the ban will also bring awareness, explaining that though city cannot keep visitors from bringing banned sunscreens to its beaches, it can discourage them. Last summer, Hawaii passed legislation banning skin-care companies from selling and distributing sunscreens on the islands that contain oxybenzone and octinoxate. The bill was opposed by various companies and business associations and even some dermatologists, who worried it might discourage people from wearing sunscreen. Still, Gov. David Ige, D, signed the bill, making Hawaii the first state to enact legislation designed to protect marine ecosystems by banning such sunscreens. That’s a problem for both marine animals and humans because, in addition to protecting sea creatures, coral reefs provide food, medication and tourism jobs for people, which has been valued at $30 billion to $172 billion per year, according to the Smithsonian’s National Museum of Natural History. The National Park Service has urged people to take a “reef friendly” approach to sunscreen shopping, instead buying skin-care products that contain titanium oxide or zinc oxide, which are considered natural alternatives to the two chemicals that will soon be banned from sale in Key West. “Sunscreens are among the products we are encouraged to use liberally to protect ourselves from the sun’s harmful rays. However, researchers are finding that while protecting humans, some compounds in many sunscreens can harm the coral on our reefs. Researchers testing the effects of sunscreen on corals explain that chemicals in sunscreen can awaken coral viruses. The coral then becomes sick and expel their life-giving algae. Without these algae, the coral ‘bleaches’ (turns white), and often dies.